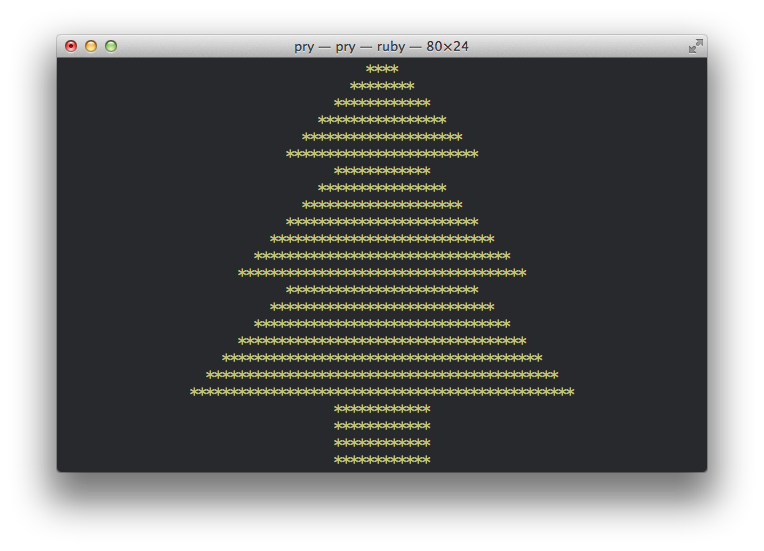 Your challenge: Make a Christmas tree. 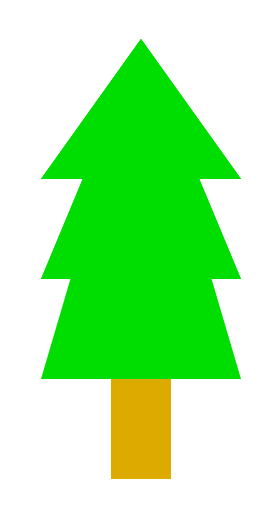 The size must be choosable by some input method, but doesn't have to be directly related to any part of the tree; however, larger inputs should produce a larger tree. How can you make it? 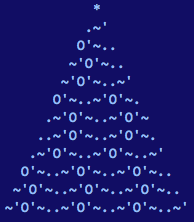 You can make the tree any way you like, other than by printing the unicode character for the tree, such as ouputting an image, ascii art, with other aspects, etc. Whatever you do, remember that this is a popularity-contest, so be creative. 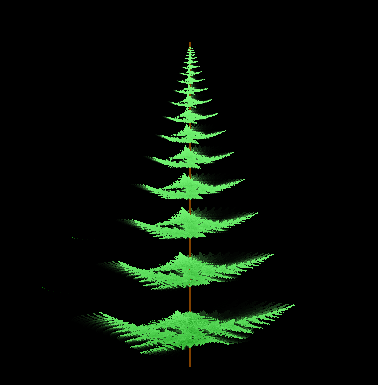 n is the size parameter, the shown tree is for n=50. Takes a minute or two to draw. 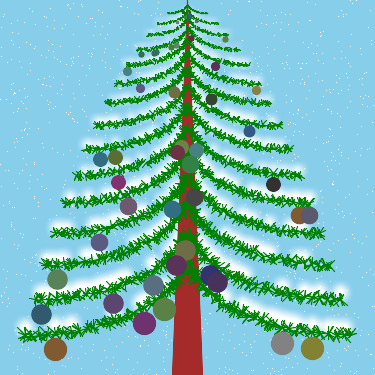 Show the animated tree online. This is my first code golf! It comes in at 295 Characters. 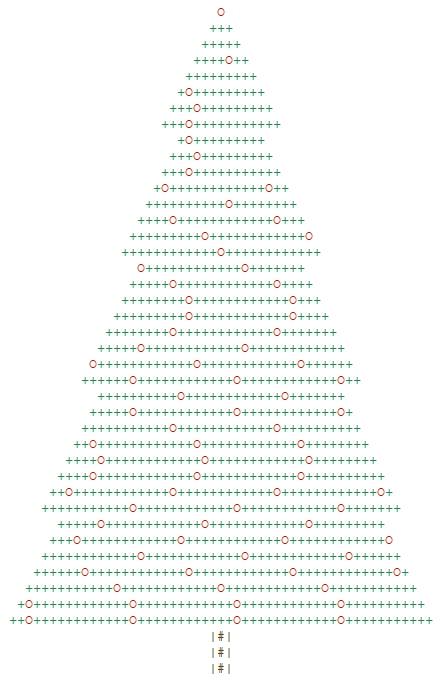 b sets the amount of rows between decreases in width (set low for a skinny tree, high for a fat tree). Must be greater than or equal to 3. It looks best when a is a multiple of b, as in the example. 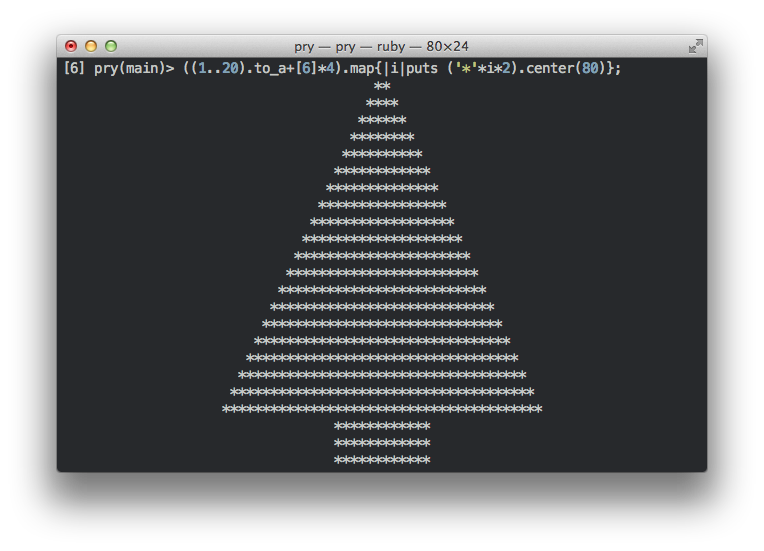 Paste into the console to create a tree. Looks better from far away! 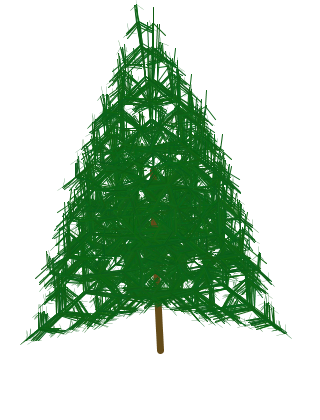 Quasirealistic fully 3D procedural fir tree generator. 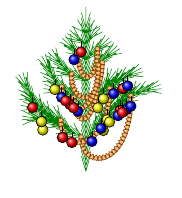 Featuring: extensive configuration with even more configuration options present in code; a zigzagy trunk; branching branches; growth animation; rotation of a fully grown tree. 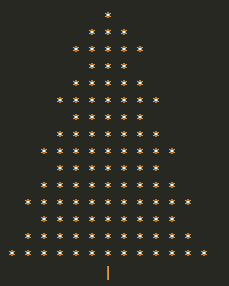 The following code will generate a chrismtas tree, with random decorations. 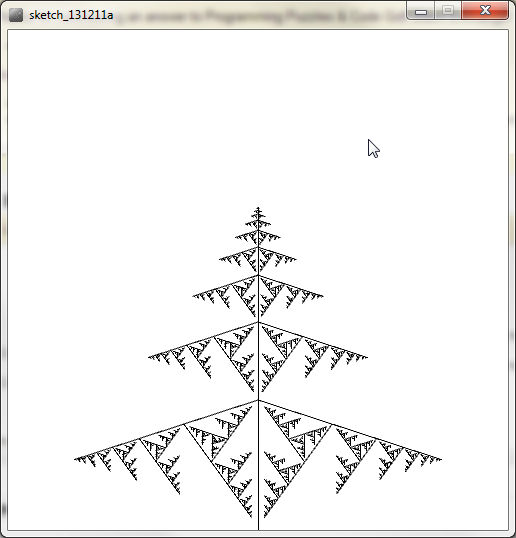 You can change both the size of the tree, and the random seed to generate a different tree. 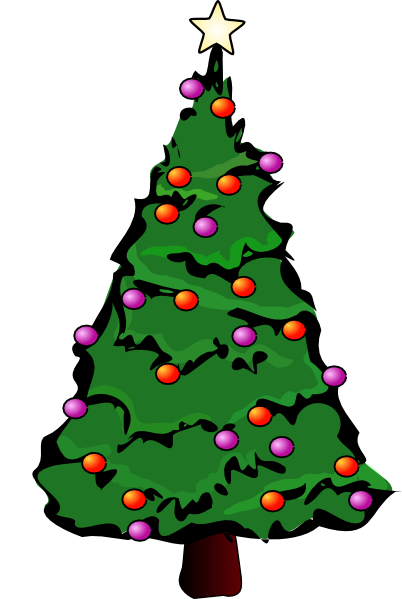 To change the size of the tree modify the order=10 to be either larger, or smaller depending on the size of the tree you want. Sizes between 1 and 25 are supported – just add the size to the URL as fragment identifier. Works in Chrome, Explorer and Firefox. In Opera is ugly, but the scaling part works. 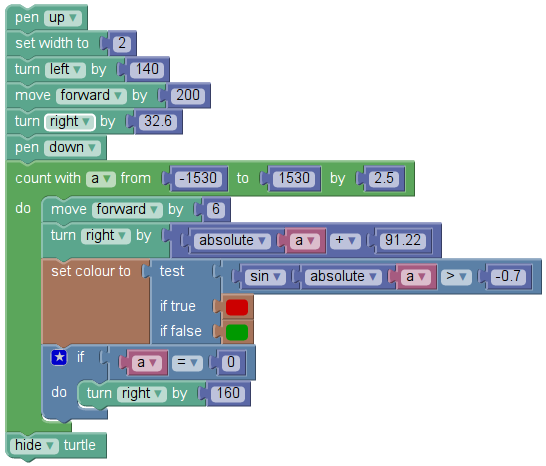 image.setToolTipText("Not only is that terrible in general, but you "
+ "just KNOW Billy's going to open the root present first, "
+ "and then everyone will have to wait while the heap is "
To alter the size, change scale to some other double value (keep it around 1 if you want to see anything). 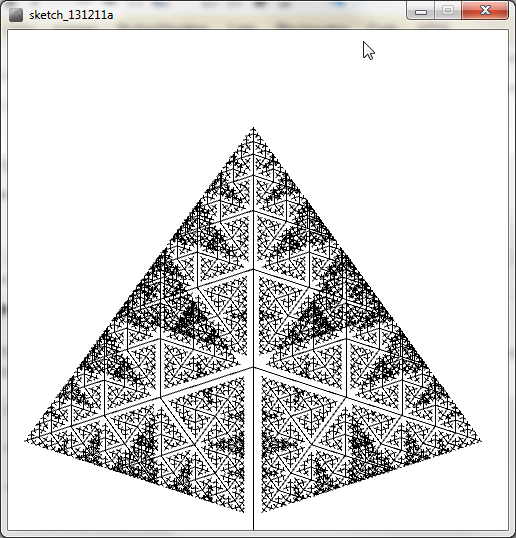 The program takes this image from the internet, resizes it according to scale, then puts it in an undecorated window where it is displayed. Clicking on the window closes the program. Also, the tool tip text is there, but the link is not. 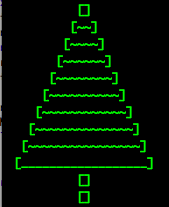 Just because I wanted to see a Christmas Tree on my calculator. I shall type it here as it appears on my calculator. This works the same way as my Befunge answer, but I use different ornaments. Yes, my elementAt function's repeated uses slows the program down because of many conversions between lists and matrices, but as I wrote it before, I decided against editing it. Also, I learned while typing this answer that © makes a comment (I thought it looked like @, but that is another character). Never knew what it was before now. I love those ∫'s; they look like candy canes. -draw "line $x,$y $(( x+RANDOM%i-i/2 )),$(( y+RANDOM%i-i/2 ))"
-draw "line $(( width-x )),$y $(( width-x+RANDOM%i-i/2 )),$(( y+RANDOM%i-i/2 ))"
-draw "circle $x,$(( y-i/2 )) $(( x+i/3 )),$(( y-i/2+i/3 ))"
-fill "rgb($(( RANDOM%5*20+50 )),$(( RANDOM%5*20+50 )),$(( RANDOM%5*20+50 )))"
-draw "circle $x,$(( y+i )) $(( x+i/2 )),$(( y+i+i/2 ))"
-draw "point $(( RANDOM%width )),$(( RANDOM%height ))"
This answer employs an approach quite different from other answers. 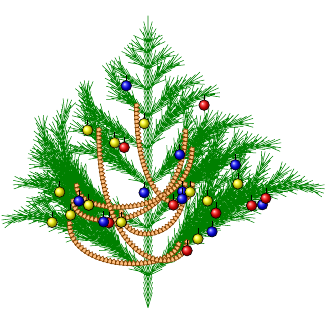 It generates a tree structure by recursively branching. 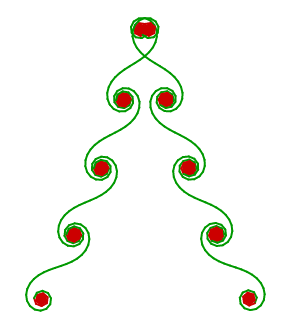 Each branch is represented by a set of circles. 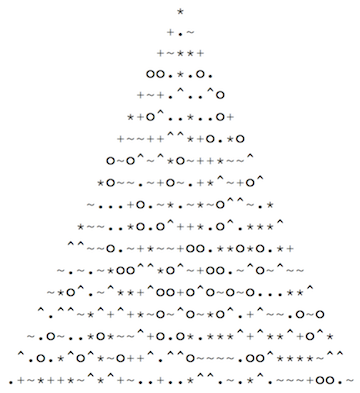 And finally the main function samples the circles and fill with characters when circles are met. Since it is done by sampling a scene (like ray-tracing), it is intrinsically scalable. 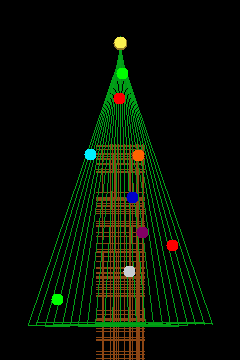 The downside is speed, since it traverse the whole tree structure for every "pixel"! 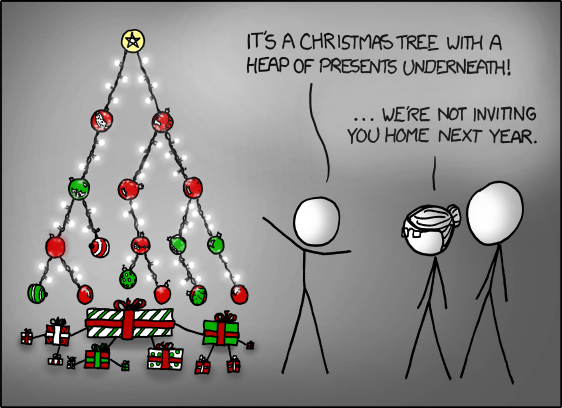 The first command-line argument controls the depth of branching. And the second controls scale (2 means 200%). Brainfuck. 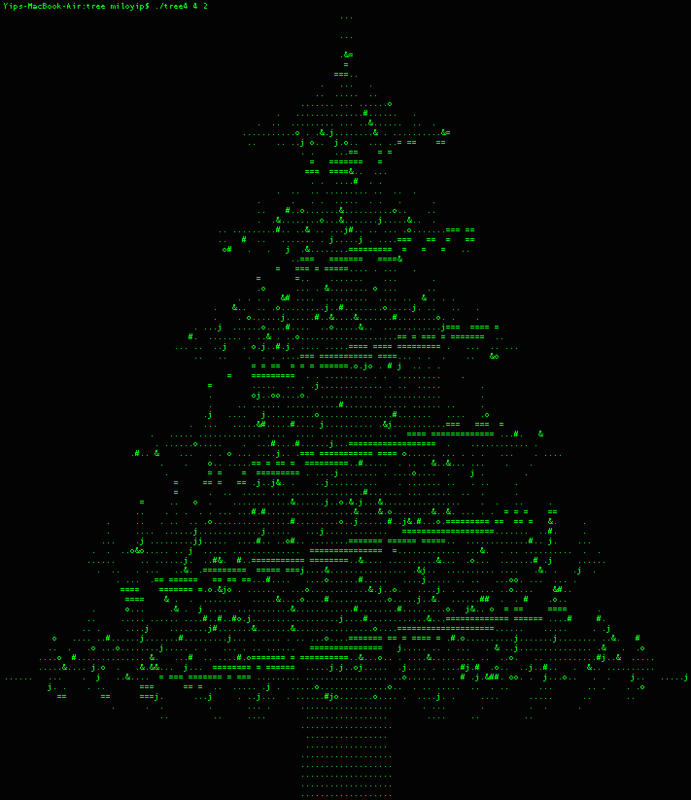 Takes as input a number (length of bottom row of leaves) and two characters. One space between each. 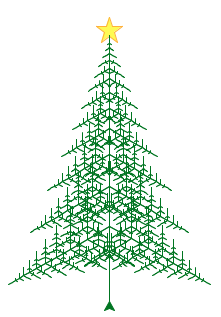 The original fractal Christmas tree. 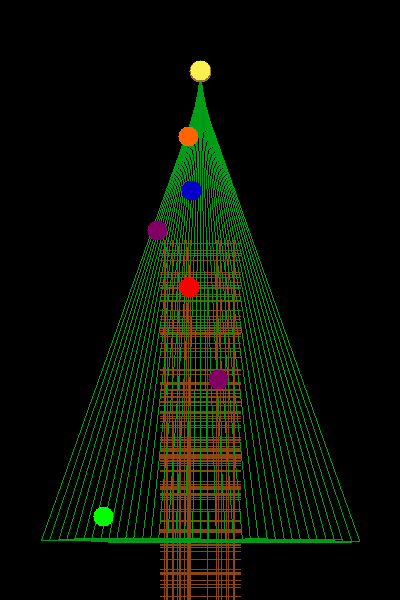 Mouse Y position determines size, use up and down arrow keys to change the number of generations. You can customize output by changing *. Based on properties of the Euler spiral. The scale is determined by the step size (move forward by: 6). An interactive version is available here. P.S. Inspired by this question. 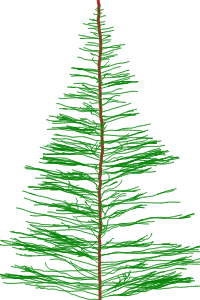 I made this tree generator using an L-System and a Turtle. boolean penDown = true; // Is pen down? Bonus! 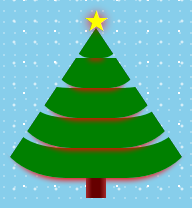 You can resize the Christmas tree after the initial input with the keys 0-9. Actually picked this up by accident while editing an answer in this question. Go figure. Use this by running the code, typing in your number that you want, swiping over to the SE post and clicking in the text field. This exploits the fact that quotes stack. 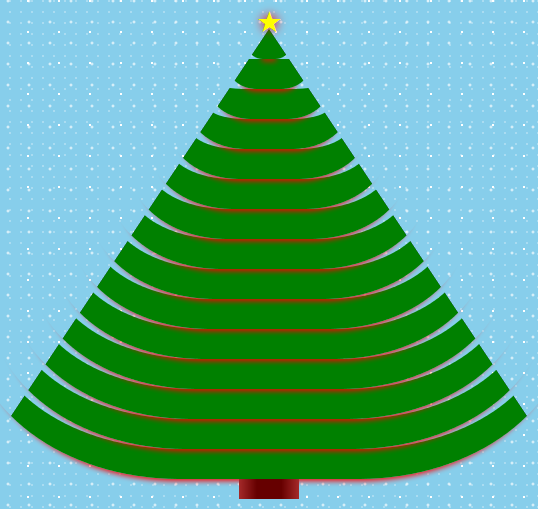 character(len=14) :: p = ".x$.+oO+oO.#,~"
The tree has a limited range of sizes, but it believe it accurately reflects the life of most Christmas trees. With a dialect to display the symbols. 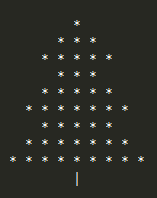 To change the tree size, just change the parameter of make-tree.